16 | June | 2015 | Troy C. Wagstaff aka CallahanWriter Blog: Topics of interest include Western Historical (1865-1899) Topics. Additionally inspirational Christian and Fibromyalgia interests. This is a perfect example of fibro-fog. I posted “Is Fibromyalgia The End Of Life As We Know It Part 2” before I posted the Part 2 in a series of articles exploring this concept. I guess that’s what you get when you are a patient of fibromyalgia trying to blog about fibromyalgia. Good example of fibro-fog. Ooops. 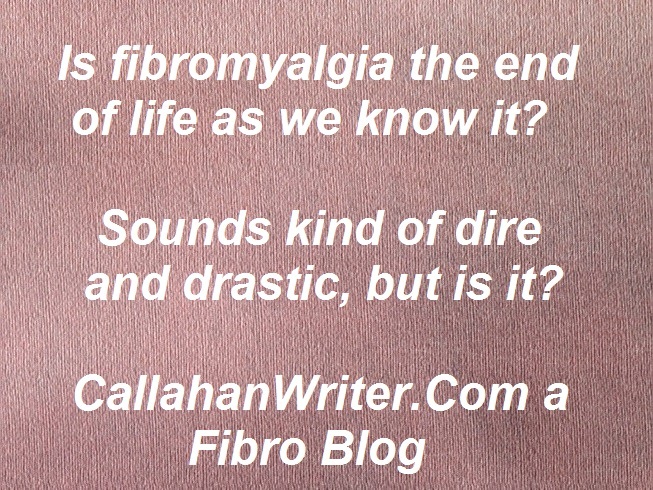 Is fibromyalgia (fibro) diagnosis the end of life as we know it? The answer is yes. With fibromyalgia, life as you knew it is over. Gone for good, never to return, unless scientists discover an all to needed cure for the disease. That sounds like a negative thing to say. I agree, it is a negative statement but fibromyalgia is a negative disease. And it is a true statement. There are many diseases that will kill you. In that sense, fibro is not so bad. Keep in mind, the statement “end of life as we know it.” Fibro is not the end of life, it’s just the end of the life you once knew. Some well meaning people may say, “you need to be positive, you can beat this but you need to be positive.” I’ve heard those comments directed at me more than once. The thing is, there is no known cure for fibromyalgia, a disease of the central nervous system. I have great hope that science will one day discover it’s origins and come up with a cure or a much better way to treat it than we have now. I feel like accepting the fact that with fibro, your life is over as you knew it is both a positive thing to say and a cathartic statement freeing you up to adjust to a new life. Within that new life you can be very positive and I hope all of you are positive in your outlook on life. Having a positive outlook on life, when you are in chronic pain and sick from the many symptoms of fibromyalgia, is hard to do but worth the effort. Sure you will have some good days and some bad days in your struggle with fibromyalgia but the ebb and flow of fibro is daunting when you don’t know what kind of day you’re going to have when you wake up. The secret to being positive with fibromyalgia lies in part with accepting the limitations and then work around them. We need to let go of the expectations we had in our old life and create new expectations for our new life under the thumb of fibromyalgia. Some people say, “I was just diagnosed with fibromyalgia but I am not going to give into it. I am going to fight it and I am going to beat it.” I’ve heard this tune sung by many fibro patients over the years and it is sad because they will use precious energy fighting the wrong battle. As we all know, energy is a precious commodity to those who suffer with fibromyalgia. We need to use it wisely. I’m talking about both physical energy and emotional energy. It’s okay to let go of the life you once had, in fact it is important that you do. Then you can focus on how to make your knew afflicted life of fibromyalgia as positive and productive as possible. You can have a positive future in spite of the pain and other terrible symptoms of fibromyalgia. In Part 2 we will look at the ways in which we can let go of life as the way we knew it and embrace the new life with a good attitude and even be successful in spite of all the interrupting symptoms of fibro in our life. Be sure to follow this blog so you will be notified when the next article is posted to CallahanWriter.com.